It is one thing to buy a utilitarian object while shopping. It is quite another to make an emotional connection with a beautifully-crafted product with a back-story. “The trend we want to create is emotional commerce, a highly-engaged experience that pulls the customer in, allows them to learn about and cherish the product, buy from us, and then share the story with their core networks,” says AHAlife CEO Shauna Mei, one of a growing army of women entrepreneurs who are changing the face of e-commerce. 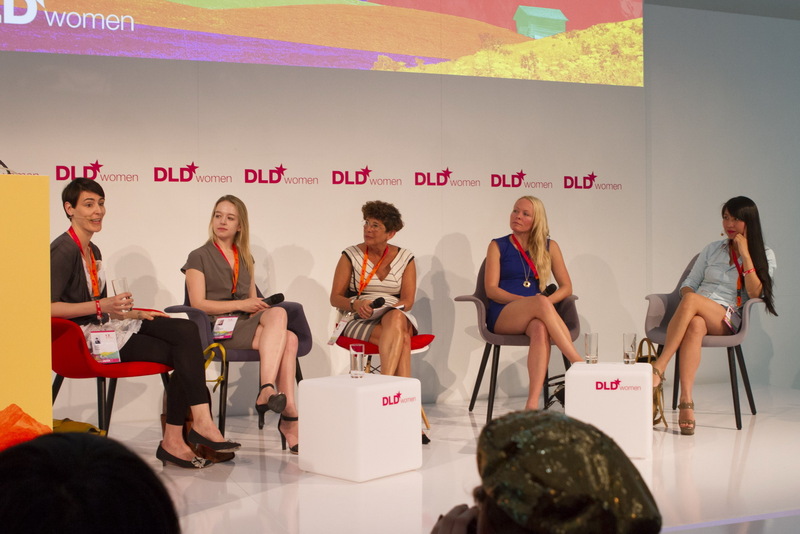 When Mei, who spoke at DLDwomen 2012, was walking back to her hotel during a trip to Kyoto, Japan, it started raining. While searching for an umbrella in a nearby kimono shop she stumbled upon earrings made out of leftover silk scraps. She bought multiple pairs and every time she wears them she remembers the experience. Mei, who was born in Inner Mongolia and now lives in New York City, says she set out to recreate the thrill of that type of discovery through a New York based e-commerce venture called AHAlife. The venture, which has so far raised $20.1 million from some high-profile backers, describes itself as a “discovery shopping destination for curated lifestyle products from around the world.” It sells everything from a $3,295 limited edition Marchesa bugle bead clutch handbag that was carried on the red carpet in Cannes by actress Eva Longoria to a $145 set of sake glasses, hand crafted using Edo Kiriko, a traditional Japanese glass carving method that has been passed down for generations. Who is the site’s core audience? “Carrie Bradshaw meets Eat, Pray, Love,” says Mei, one of an army of women entrepreneurs changing the face of e-commerce. Objects made by artisans in places like Italy and Japan – the type of products sought by the cosmopolitan women who shop on the site – are generally not sold online, says Mei. In fact, some 95% of luxury goods are still sold off-line, she says, representing a big business opportunity. The key to “digitizing luxury,” is the ability to offer customers the same type of emotional connection they might feel if they had discovered the item in a bricks and mortar shop and had a sales person lovingly explain the item’s history and value, says Mei, who graduated from MIT with a degree in electrical engineering and computer science with a concentration in artificial intelligence. Unlike flash sale sites, which Mei maintains can hurt luxury goods brands, AHAlife does not offer discounts. While its products are not cheap, it offers an aura of exclusiveness and suggests that whatever you buy there will be special and somehow make you special. The story around an object – how it was made, where it comes from – is so important to the buying experience that Mei refers to AHAlife as a media company, rather than an e-commerce company. Although women entrepreneurs are still far outnumbered by their male counterparts they are behind a significant number of successful e-commerce ventures such as Gilt Groupe, Rent the Runway, notonthehighstreet.com and One King’s Lane. AHAlife is an example of the next generation of shopping sites, e-commerce 3.0, which is all about touching shoppers’ emotions, personalized curation and social sharing. Here too, women are making their mark. Joyus, for example, a new video commerce site launched by former Google exec and serial entrepreneur Sukhinder Singh Cassidy, seeks to tap into consumer’s emotions. Other 3.0 sites include Fab.com, a fast-growing social sharing site specializing in design which sells everything from pieces of furniture to smaller accessories for the home. In June, Fab announced that it was buying Llustre, a London-based sales site for design founded by two women entrepreneurs, Vivienne Bearman and Tracy Doree. Llustre, which sold to Fab only 10 weeks after going live, set out to create a community of designers and brands and people who are passionate about home wares and interiors, and make the experience more “human and personal,” according to Bearman. Llustre, now part of Fab Europe, uses social photo-sharing to allow users to upload photos of their own homes and to specify items that are important to them. AHAlife’s site includes suggestions from a variety of “trendsetters and tastemakers,” including Donna Karan, Wendy Deng Murdoch, Tina Brown and American fashion consultant Tim Gunn, known for his role as an on-air mentor to designers on the U.S. reality television program Project Runway. Murdoch, for example, recommends a $650 limited edition “resin cuff.” The site explains that Ivanka Trump and Wendi Deng Murdoch became fast friends years ago as neighbors at the Park Avenue Trump building and have remained close ever since. In celebration of their own friendship and Murdoch's film, “Snow Flower and the Secret Fan” — which is about female friendship — Trump and Murdoch collaborated on a new limited edition bracelet for Trump's jewelry line. Available exclusively at AHAlife, the cuff features an art-deco fan design accented in diamonds set in18k white gold, and the interior of each one is engraved with the Chinese character for friendship. Sharing a remote connection with the rich and famous may be enough to get some clients to buy a bracelet designed by Murdoch and Trump or the same clutch carried by actress Longoria. But AHAlife also sells a variety of goods and services connected to social causes. For example, designer Karan, another AHAlife curator, recommended $2,500 tickets to the June 5th Veuve Clicquot Polo Classic on New York’s Governor’s Island as a chance to both rub shoulders with New York’s elite (designer Marc Jacobs was scheduled to be there) and do some good. Proceeds from the tickets, which were placed on sale on AHAlife’ site, went to The Hope, Help & Rebuild Haiti initiative, started by Karan and her Urban Zen Foundation. Such offerings are part of what makes AHAlife so different. It seeks to address all parts of its clients’ lifestyles, offering not just clothes, jewelry, food and products for the house but experiences. For example, for $125 you can not only buy organic, extra virgin Italian olive oil but “own” the olive tree in Italy that produces it. The Nudo gift box includes a sample of extra virgin olive oil, a grow-your-own-olive-tree in a tin kit, adoption registration and booklet, and three large bottles of olive oil from your own tree next spring (April 2013). Also available on the site, for $28, is an exclusive guided meditation for AHAlife on mastering the Law of Attraction and “using it to create a happier, more fulfilling life,” recorded by noted author and physician Deepak Chopra, an AHAlife board member. The site is also now offering specially-arranged trips for a privileged few, such as a wine tours in Tuscany, says Mei. While AHAlife does not make its revenues or site traffic public, it is clearly gaining traction. And Mei, who prior to launching AHAlife worked at Goldman Sachs as an investment banker, co-founded a luxury investment boutique with Jeffry Aronsson, the former CEO of Marc Jacobs, and held the title of chief operating office at Swedish wellness and active wear company Casall, has had no trouble attracting investors for follow-on rounds. They include venture firms Doll Capital Management, FirstMark Capital and Japan’s Rakuten. What’s next for AHAlife? In an unusual move for a young e-commerce site, it has opened its first bricks and mortar store, tucked inside theRegalo at The Bazaar store at the SLS Hotel at Beverly Hills. AHAlife’s micro-boutique is inside a Philippe Starck-designed space where products are displayed in museum-inspired freestanding vitrines. The products are marked with QR codes.